Progressive Cavity Systems | EGM, LLC. EGM Progressive Cavity Pump systems can be ordered in a wide range of capacities and configurations. The systems feature tubular TIG welded stainless steel frames or weather and UV resistant thermoplastic frames for the ultimate combination of portability and durability. Progressive cavity pump systems are built with quality components that help deliver high performance and long life. 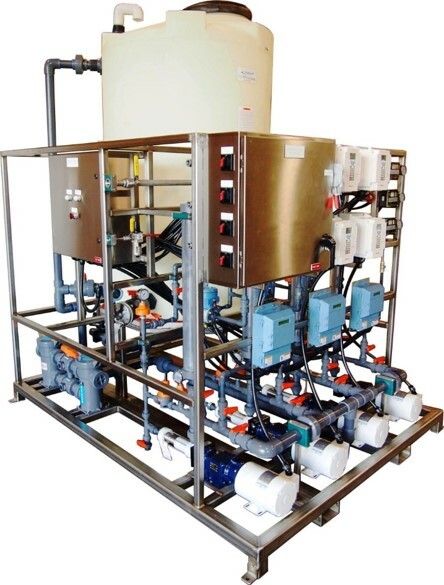 EGM progressive cavity feed systems deliver smooth, pulse free flow for accurate metering service and can be fully equipped with a host of options and accessories to deliver a turnkey package. Systems can be configured with pump casings made from cast iron, 316 SS, or HD polyethylene. Depending on the nature of the material being pumped, internal wetted components may be made from various combinations of 316 stainless steel, titanium, Viton, Buna, or EPDM. Piping material choices include stainless steel, Alloy 20, Hastelloy, PVC, CPVC, Kynar, and Polypropylene. 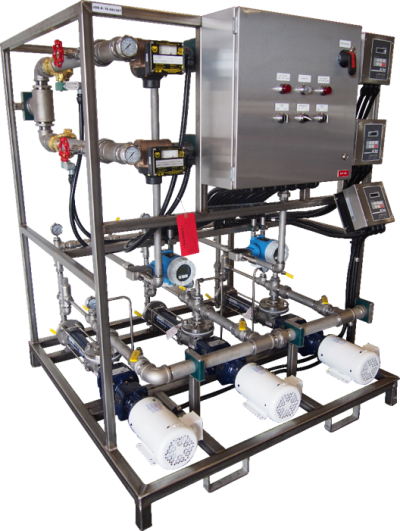 Systems can be figured for batch transfer, continuous transfer, or precision metering service by incorporation of skid-mounted accessories such as control panels, starter panels, variable frequency drives, flow meters, pressure instrumentation, automatic valves, and pre-programmed controllers to execute a specific duty.